Brian Dompe knows why the University of Alberta's new and innovative Supporting Healthy Aging by Peer Education and Support (SHAPES) program is so popular among Edmonton's seniors. 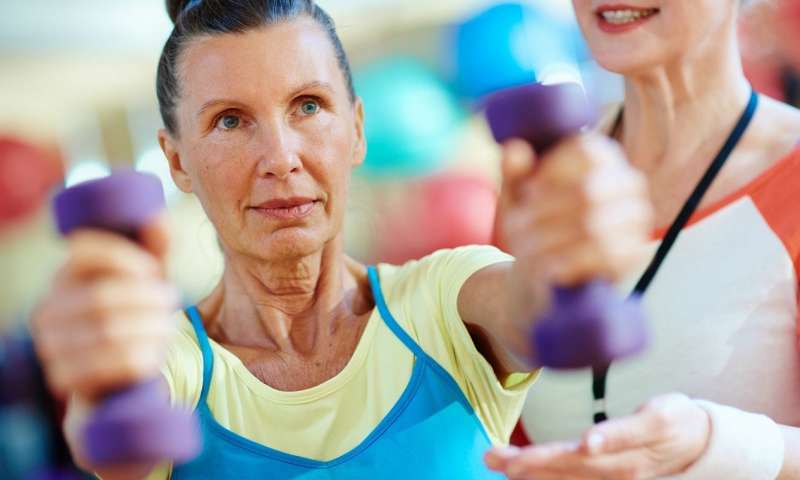 "It's a lot easier to accept health advice from someone who is a true peer and living through aging-related health changes than a 20- or 30-year-old telling you what you need to do," said the 70-year-old retired government employee. Dompe is one of 12 health coaches participating in SHAPES—a one-of-a-kind health education program designed to empower preventive health behaviour and be delivered peer-to-peer among seniors. "SHAPES grew out of the Division of Geriatric Medicine's community engagement lecture series on health concerns for older people," explained Adrian Wagg, a U of A geriatric physician in the Faculty of Medicine & Dentistry. "We thought the best way to broaden our reach, garner true engagement and influence real change among seniors may be to use a train-the-trainer approach and cascade the model across seniors' centres and organizations." Preliminary investigations into the 12-week program—which contains four three-week interactive modules that focus on heart and bone health, as well as nutrition, physical activity and social engagement—show that the approach is working. It's the only intervention in North America that is peer-to-peer and covers content for preventing a broad range of diseases, noted Wagg. "Based on early feedback, seniors are really enjoying the program, and it's increasing their health literacy and changing behaviours," said Saima Rajabali, clinical trials project co-ordinator in the Division of Geriatric Medicine. "For example, they're tracking steps and every week their steps are increasing, and they get excited." Dompe said the health information he obtained over his six-week training period, provided by the Department of Medicine, was a wake-up call to get back on board with being active. "I increased my activity including walking and running on my treadmill, elliptical and stationary bicycle. If I don't hit my quota, then I make a point of doing it. I also changed my portion sizes as I don't have great willpower," he said. Rajabali added, "The health coaches are highly engaged and regularly make suggestions that improve the education. Right now, all our sessions are booked into the fall and there is a wait-list." Dompe, who's led a few seminars in the past, said he's never seen such engagement among seminar participants as that of SHAPE participants. "It can be hard to get people to pay attention in workshops. With SHAPES, everyone is alert and asking a lot of questions. The population is getting older and there is a real concern about maintaining health longer." The number of older adults surpassed the number of children in Canada in 2016, said Stephanie Gartner, a research assistant on the project. "And the numbers are projected to rise. In Canada, between 1960 and 2009, the proportion of seniors aged 65 plus rose from eight to 14 per cent, and it's estimated it'll rise to 23 to 25 per cent by 2036," she said. The aging population also tends to have more chronic conditions that affect not only quality of life but also health-care costs, added Rajabali. "Self-management, inspired by a program like SHAPES, is an important measure one can take to control one's health, improving quality of life and allowing independence later on." As the SHAPES research continues, the team will investigate just how much it's influencing health behaviour, added Wagg. The goal is to also have health coaches train more health coaches as the program expands. "It's our hope that improved health literacy empowers people to interact with health-care professionals and manage their diseases, and also seek health-care resources more appropriately," added Wagg.